In this section I show pieces which were given as presents or prizes, either in competitions, to mark special occasions or in recognition of other achievements. I understand that records were not kept in the factory, but further research is required. Did your family member receive one of the items shown below or do you have a piece which is not included and would like it to be added? If so do let me know through the contact page. Christening Mug Marked "Scott January 31st 1934"
A plate which is possibly part of a dinner service presented to Mrs Thomas, wife of J H Thomas, Dominions Secretary by the Duke of Devonshire in recognition of his 25 years continuous representation of Derby in Parliament. The presentation (which included a cheque presented to Mr Thomas) was reported in the Nottingham Evening post of Wednesday 16th January 1935. The date cypher is probably that of 1933 but this is not certain because of the rather random application of "dots" in the downward arrow marks. Reputed to have been commissioned by his party but not actually given to him and divided up between the members following his unpopular decision to join the National Government in 1931, the factory mark appears to contradict this version of events. Further research required. Taken from an article which appeared in the Bygones pages of the Derby Telegraph November 4th 2016 this image shows amateur boxer Harry King holding the actual Royal Crown Derby Trophy which was presented to him as sportsman of the year 1927. He would have received a smaller replica to keep of which an example is shown below. See http://www.derbytelegraph.co.uk/boxer-dad-harry-was-presented-with-the-hospital-cup-in-1927/story-29866617-detail/story.html#1 for the full article. These were competed for in the pre-war period at an annual carnival day organised to raise funds for the Mayor's Hospital Fund. With the formation of the National Health Service in 1948 there was no longer a need to raise money for Derby Hospitals. This example is dated 1939. Mugs and larger Loving Cups in the posie pattern presented to returning servicemen after the war. The mugs are inscribed "In Commemoration of the Allies Victory and Peace 1939-1945" (or 1946) followed by the name of the village. Here are examples from Over Haddon, Weston-on-Trent and Youlgrave and Alport. The Allestree Loving Cup is inscribed "From the Parishioners of Allestree in gratitude for your Service during the World War 1939-1945" The Duffield Loving Cup has different wording - "From the Parishioners of Duffield in grateful Recognition of your Patriotic Services during the War 1939-1945"
In an article which appeared in the Derby Evening Telegraph on Thursday 23rd January 1947, it was reported that "each of Duffield's 230 ex-Servicemen and women is to receive an inscribed Crown Derby china loving cup and 30 shillings from proceeds of Duffield Special War Savings campaigns. The distribution will take place at the Church Hall, Duffield, on Wednesday February 5, between 7 p.m. and 9 p.m." The balance of the fund was handed to the Duffield branch of the Royal British legion for distribution among needy cases in the parish. If you are aware of any other examples from different Villages I would be delighted to include them. In 1947 Princess Elizabeth was presented with a "Princess" pattern service on the occasion of her marriage to Prince Philip. The gift was made up of Crown Derby tea, coffee and dessert sets plus 12 china plates, each with a different view of the town and county. The 174 pieces were contained in 13 special cases and were on show in the Derby Art Gallery for a week. The admission of sixpence for children and threepence for children went to the Derby War Memorial Fund. "Guy" Christening Mug. Undated but 1923-1953 from the factory mark style. This would have been on the table as a gift for the ladies at an annual dinner event. From 1945 the Board of Trade restrictions were relaxed in respect of certain fancy items to include ashtrays. Tankard which I presume was presented to the England team members or made to commemorate the France V England amateur football match at Cherbourg in 1951. Apparently the match ended in a three all draw. The image was taken from an original by the artist Isaac Robert Cruikshank entitled "Foot Ball". A plate in the 2451 pattern which would be unremarkable apart from the inscription on the back. It is shown above and was presented on the occasion of a friendly match between Derby County FC and the German Team Borussia Dortmund in 1951 which formed part of the Festival of Britain celebrations. It is not clear who actually received the plate and if anyone knows I would be very interested to hear from them. Gadroon shape plate marked "F.I.F.A. Reunion London 1951" Apparently these were commissioned to be presented as gifts to the delegates. The tournament had been hosted the previous year in Brazil where England had been defeated 1-0 by the US team. It is very unlikely that these would have been regarded as an inducement to host the games at this time, because of the general lack of interest and funds due to the devastation in Europe caused by the War. This McGowran cup produced by Royal Crown Derby was presented to Barrie Sheard by the Derby Rowing Club in recognition of his team of four rowers and cox winning their “Maidens” race at the Derby Regatta held on Saturday 11th July 1953. The start was at St Mary’s Bridge, with finish at the Clubhouse. The importance of the Regatta is demonstrated by George Morris's BBC Home Service report on the day's events in the 18.25 p.m. “Sport in the Midlands” bulletin. 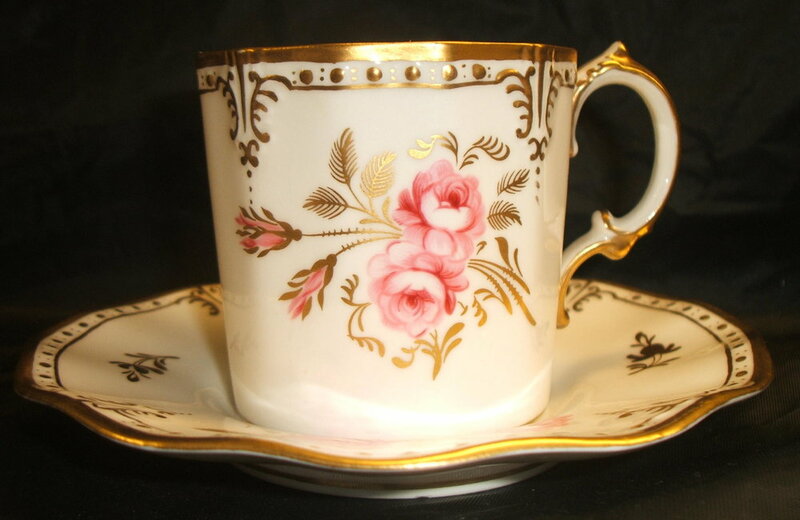 Golden Wedding tea cup and saucer in the "Surrey" shape and dated 1953. Duchess Tray in pattern 9875 (Posie Blue Line) inscribed "The Pathfinders and Derby Motor Club Bemrose Trophy Trial N H Phillips 1951." Posie Goblet inscribed "B H M Viney 1952." Hugh Viney led the AJS Works Team in the Post War years. 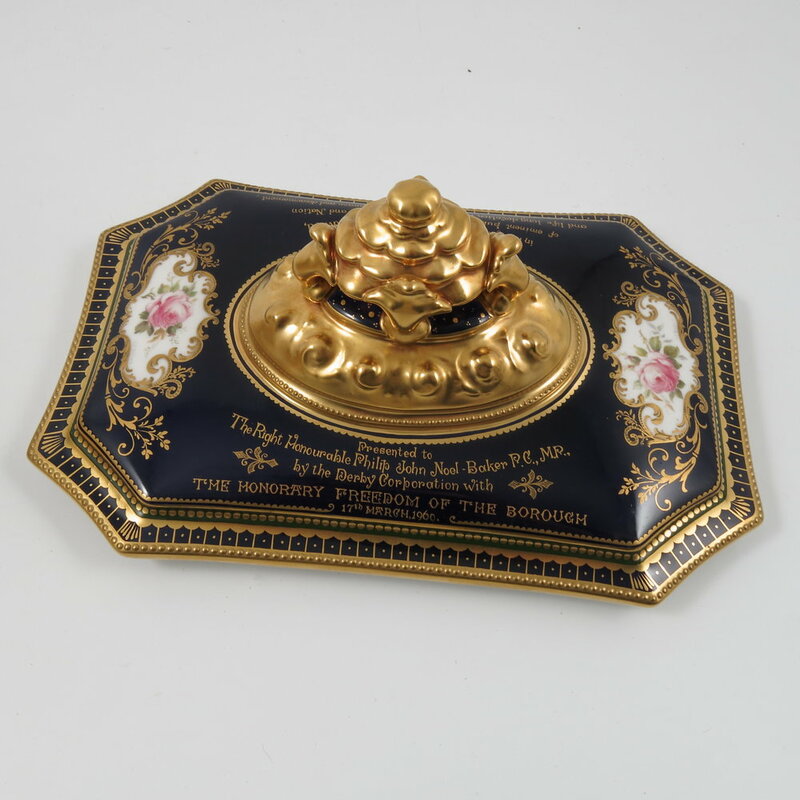 The Posie sweets tray is marked "F Hickman 1953" and is followed by a loving cup marked "Midlands Rally 1955 G M Gardner" The loving cup in the 1128 pattern is marked "Midlands Rally 1955 R Whitley". 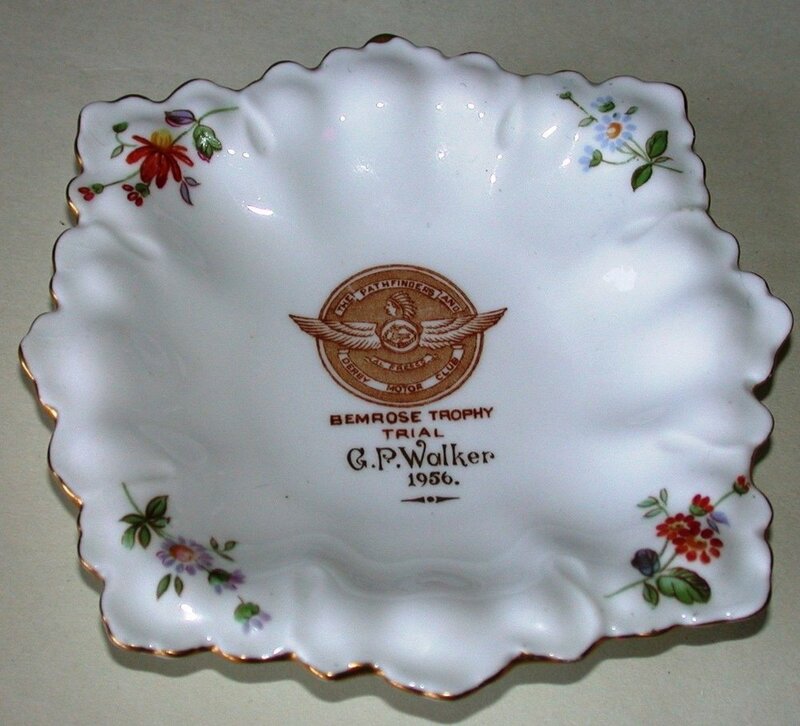 The images of the Posie Sweets tray marked "C P Walker 1953" and a Posie Sweet Dish shape No. 986 also presented to "C P Walker" but dated 1956 are by courtesy of ebay Seller "Swanstream". 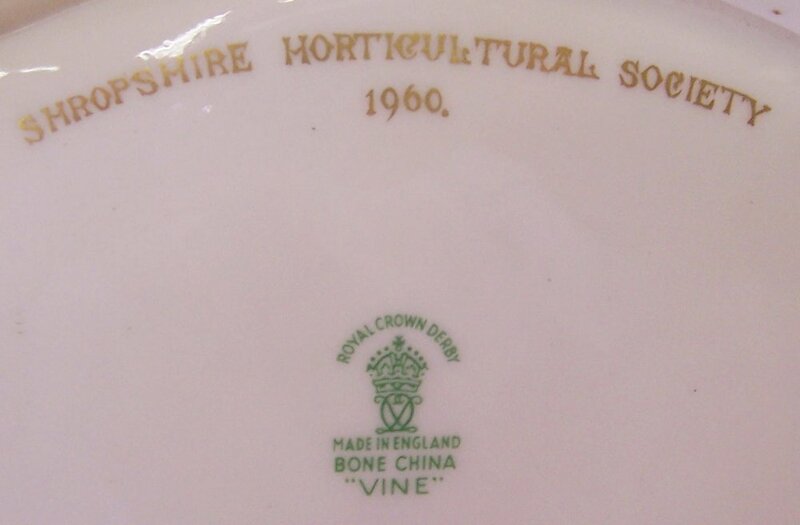 Vine Cobalt plate inscribed "The 76th Annual County Show, Derbyshire Agricultural & Horticultural Society, Coronation of Queen Elizabeth II 1953". 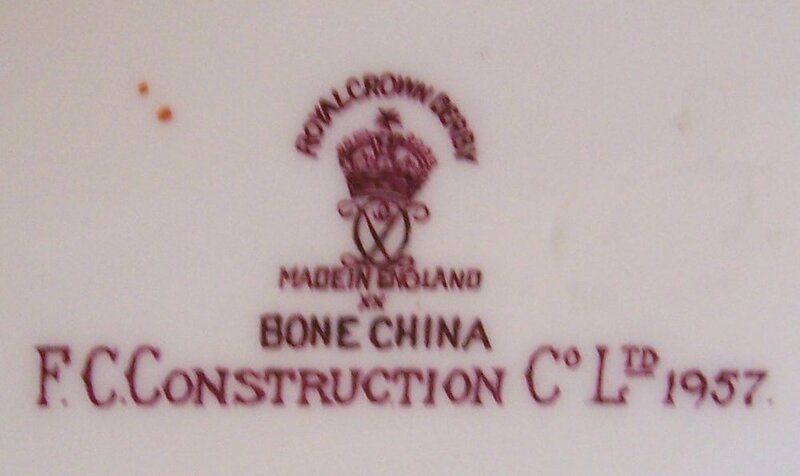 Bon-Bon 386 Shape Tray and a Loving Cup (dated 1954) both marked with the logo of the Royal British Legion. 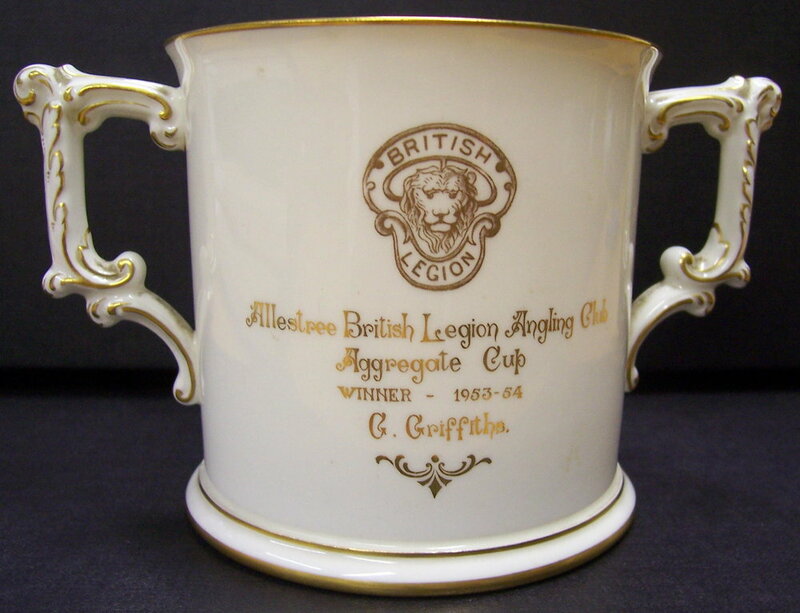 If anyone has further information regarding "G Griffiths", the recipient of the Angling Cup from Allestree British Legion, I would be interested to hear from them. 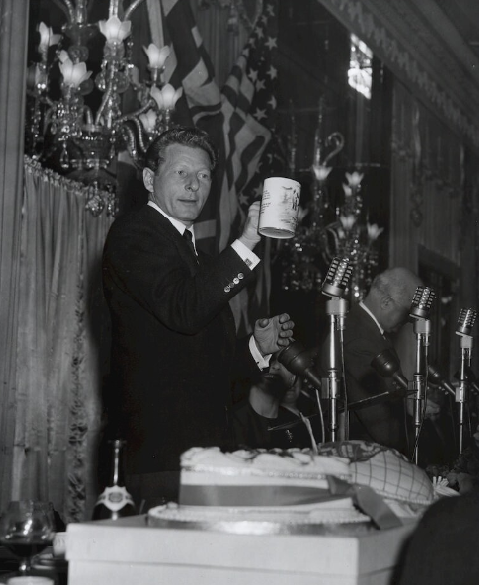 Danny Kaye being presented with a Royal Crown Derby Hunting Tankard at the Variety Club's Second Ladies' Day Luncheon held at the Dorchester Hotel, London 7th June 1955. An article in the Derby Evening Telegraph on Wednesday 13th April 1949 announced that a sports meeting would be held at the Municipal Sports Ground on June 11th in aid of the Derby Borough War Memorial Fund. Events were to include 100 yard and one mile races, "relay races for boys' and girls' schools, and quarter and half-mile events for cyclists". Winners were to hold the full size cup for one year and these are replicas which they were allowed to keep. Above are Snooker 1957 and Rifle Shooting 1961. I have also seen Rifle Shooting 1954, Boxing 1949, Service Rifle 1966 and Billiards 1957 & 1958. I presume that these were handed out as prizes or placed on the table as gifts at an annual works event, but if anyone can shed more light on this I would be very interested to hear about it. 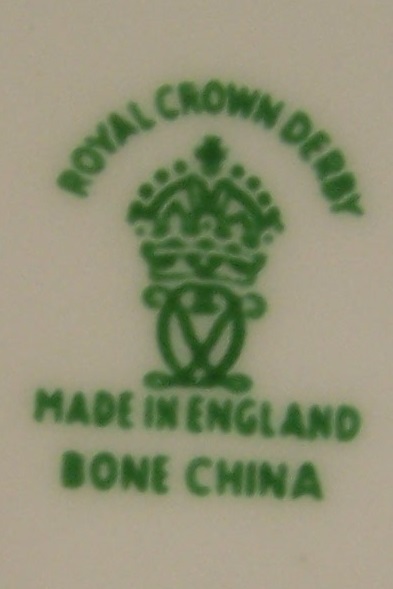 In 1957 the Derby Corporation presented the Queen with a service in the Royal Pinxton Roses Pattern consisting of 120 pieces. See photograph taken to record the event under "Archive Photographs". Tudor Tray marked "Derby and District Senior Football League 1957-1958" awarded to W Berry. This tray was presented to West Ham player Jack Burkett following the West Ham United V England Youth XI match played at Upton park on the 10th November 1958. An oval Vine shape dish in the Montreal Green version with a Garnett centre. Presumably this was presented as a prize at the annual show in 1960. Freedom Casket presented to the Right Honourable Philip John Noel-Baker P.C., M.P. by the Derby Corporation with the Honorary Freedom of the Borough 17th March 1960. Also inscribed "This honour is conferred in recognition of the 1959, Nobel Peace Prize award, of eminent public services to the Borough and Nation and life long devotion to the cause of world peace and disarmament" The scenes of Derby are signed by Albert Haddock. 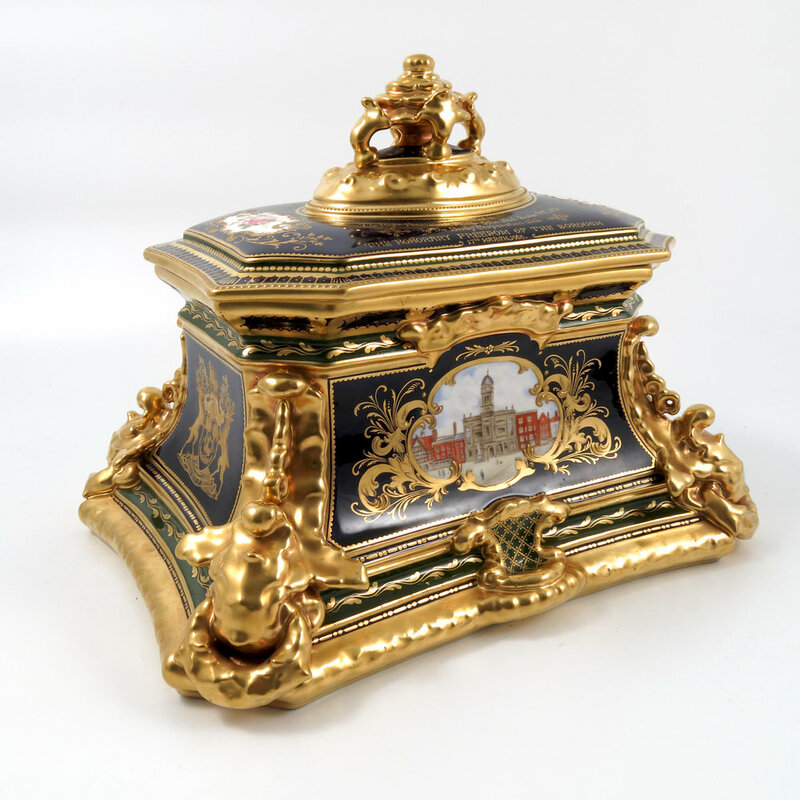 Images courtesy of Philip Serrell Auctioneers. "Philip John Noel-Baker, Baron Noel-Baker (1 November 1889 – 8 October 1982), born Philip John Baker, was a British politician, diplomat, academic, outstanding amateur athlete, and renowned campaigner for disarmament. He carried the British team flag and won a silver medal at the 1920 Summer Olympics in Antwerp, and received the Nobel Peace Prize in 1959. An undated tray C1960 which was most probably intended as a gift at a dinner event. The Radio Industries Club later became the Television and Radio Industries Club. The manufacture of a mug in his honour would have been a significant accolade at the time. I have not so far found any other examples for the period. The all white version does appear from time to time, but the coloured example is rarer. The image here appears courtesy of Messrs Bamfords Auctioneers. The black and white photograph of Pat is © The Transdiffusion Broadcasting System. 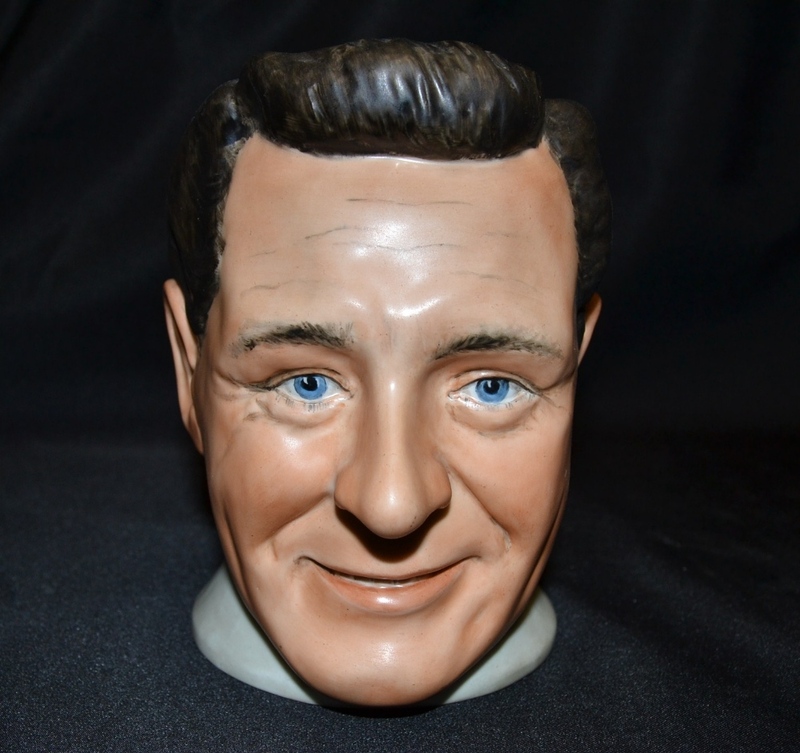 I have not been able to establish an exact date for the mug. I do wonder if his appearance at the ATV Stand of the Derby Radio Show of the 15th September 1961 coincided with his visiting the factory, but further research is required. If you can provide any information please get in touch via the contact page.